ZODIAK products are the Trading name of the GRG high quality ceiling tiles for KGCF, manufactured from high grade gypsum powder, empowered with fine and clean fiber glass mesh. It has all features and benefits to be the best durable, safe, healthy and workable choice for internal decorating designs/finishes..The main two product lines of ZODIAK brand covers the requirements for both of the movable T-Shaped suspension ceiling system, and the plain fixed units system. 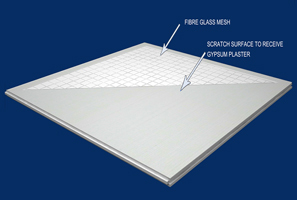 ZODIAK Plain Ceiling Tile is natural product, made of pure Gypsum powder, special alkali-resistant fibers, supported with full-sized fiberglass reinforcement mesh, for extraordinary strength. ZODIAK Tiles offers high durability features due to the 2 methods reinforcement in the same ime, chops of fiberglass and an Alkali Resistant fiberglass mesh. 2.0 hrs. Fire stable, incombustible. 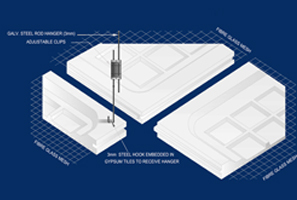 ZODIAK Tiles offers excellent isolation and acoustic absorption levels, especially used where noise reduction is required.